Good design requires the informative process of design thinking, which can include research, testing, theory, observation, user experience, and a myriad of other approaches that allow the designer to develop a solution that is better than what is currently available. At the College of Design, design thinking is at the core of the curriculum for all of our disciplines. Sometimes this means taking a step back before you can move forward. Understanding more than the why, how, and who, and thinking more broadly about the need, the application, the user, and the materials used in an effort to think outside of the box and discover alternative solutions. Ideation is part of the process and is iterative. The College has a wealth of resources for students to expand their ability to design, build, make, and collaborate throughout the design process. 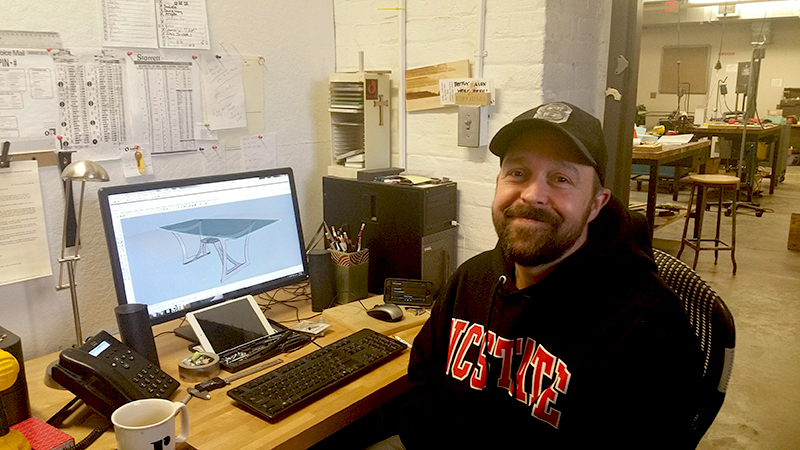 One of these resources is the Materials Lab, a place that provides space, equipment, and trained personnel to assist design students in their projects. Design ideas that originate in the studio can be implemented in three dimensions in the Materials Lab. Full-scale working prototypes and scaled models can be made to present design proposals. 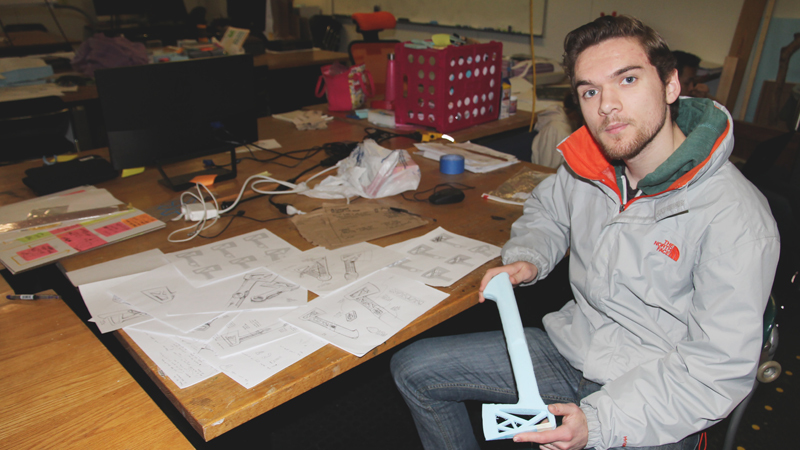 For current senior in industrial design Andrew Keel, design thinking is more than just a design process; it’s the way he approaches a lot of things. “It’s about understanding how other [users] utilize the product and then make it better,” he states. Keel, an outdoor enthusiast, often devises his own projects with tools or gadgets that interest him and he would likely use. Recently he decided to redesign an axe and further applied the constraints of using a mainstream label, Gerber Gear , incorporating their brand standards into his design process. In other words, he devised his solution as if Gerber Gear was his client for his product. With the understanding that the axe was the end product, he examined and researched the problems and limitations with current designs for hatchets, most specifically, camping axes. Based on these findings, he concluded that users often lose the hatchet sheaths and covers, which can pose a safety and durability issue. 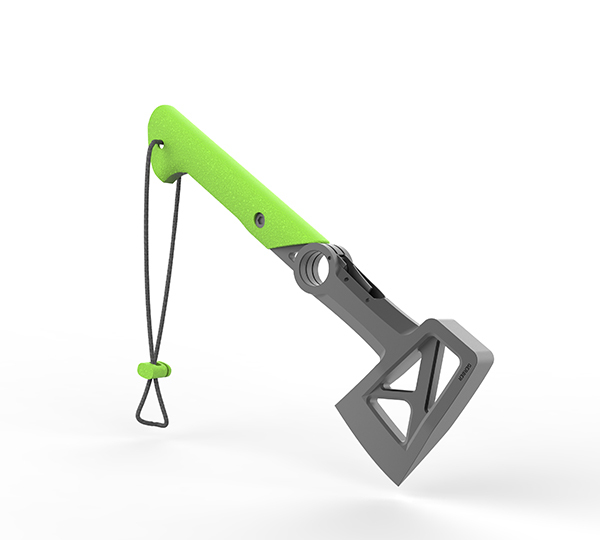 This became a focused limitation to address in his ideation process to create a hatchet that would be safe and easy to carry for backpackers, campers, etc. He crafted a quick hand-made prototype to illustrate the concept of his proposed axe, which he then shared with potential users. Sharing the prototype with his previous Boy Scout troop, employees at REI, and several other college students who are outdoor enthusiasts allowed him to gain valuable feedback. From this group of users, he was able to identify two critical findings: 1) his idea was worth pursuing, and 2) he learned the key features and elements that were considered most useful to these users. He continued with functional ideation, which is like brainstorming a variety of ideas and concepts to address his end goal. Throughout this process, he consulted with engineering students and others to validate if his ideas were feasible. His final, functional concept included a design where the handle separates or folds up to become the blade-guard, which addressed the earlier concern. With this concept, he then applied the Gerber Gear brand standards that would satisfy this client and allow this new product to fit seamlessly into their current product line. Some of the tools Keel used included Rhino and SolidWorks, both CAD programs common to product design. These files were then submitted to Rob Watson, Special Trade Technician in the Materials Lab, who converted the files in order to correspond with the CNC machine to prototype the product. Watson confirmed with Keel the appropriate scale used and the material used for machining and then converted Keel’s 3DM files. A 3DM file is an open-source 3D model format and contains a variety of information for 3D modeling such as surface, points, and curve data. These files allow CAD, CAM, CAE, and other computer graphics software to accurately convert and exchange 3D geometry and rendering for the machining process. Watson shares how the process works: “I program the tool paths in RhinoCAM, which is a plugin for Rhino, the file is posted to the CNC machine and the origin is set at the machine the same as the CAD file. It reads the G-code as tool paths and hollows out the stock. The first pass is a roughing pass and then a finishing pass which is smooth.” He also explains that there are some projects that need machining on both sides in order to convey detail designed on all sides. Projects that don’t require flipping are architectural typography maps that only requires one side. In the Materials Lab, they have two different CNC machines that vary based on the size of the project. Watson doesn’t recommend machining steel due to the cost and length of time needed, which can in Watson’s words, “clog up the queue.” He has machined anything from blue foam to titanium but recommends aluminum as an alternative to steel.